Last Sunday, the lads did their job against Cagliari. Like in the Crotone game, Bianconeri took their time to find the way to punish the opponents, who started the game very well, but eventually found the lead with Gonzalo Higuain, who then doubled his score and sealed the game. Not a stellar performance by any stretch, and the squad seems to playing down the opponent a little bit, but still good enough to come away with three points and continue marching. 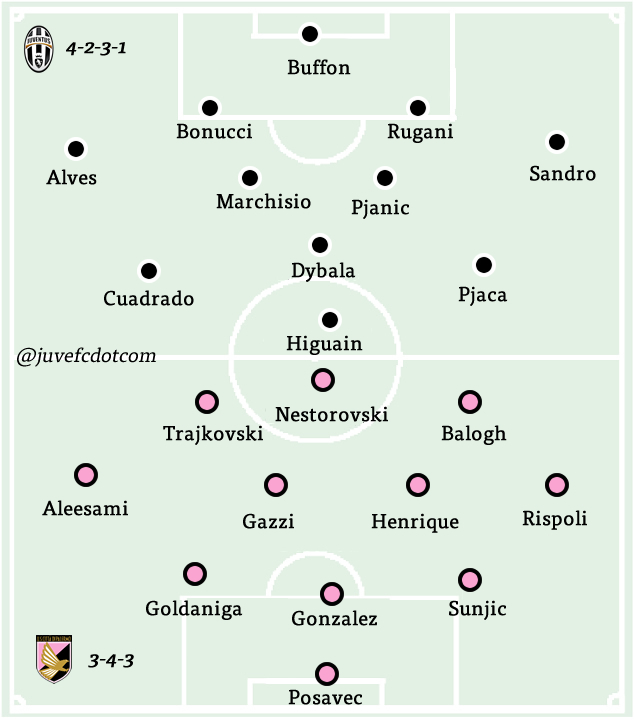 Before it is time for Champions League football, Juventus take on Palermo, the third worst team in the League. The game has been moved to Friday because of the Porto game, a welcomed improvement compared to the last seasons, so some heavy rotation is not necessarily needed because of the extended layoff, but it is still planned to keep everybody fresh. The injury bug continues to hit the defence: Andrea Barzagli and Giorgio Chiellini are dealing with minor hamstring problems and they are at risk also for Wednesday. Luckily for Juventus, Daniele Rugani has been on a steady rise since he started played more often and also Medhi Benatia is pretty dependable. One of the two will start in a defence completed by Dani Alves, Leonardo Bonucci and probably Kwadwo Asamoah. Mario Mandzukic is suspended so there will be some changes upfront as well. Allegri hinted that he may revert back to a three-man midfield, but at this point Marko Pjaca is still the favourite to start at his natural position on the left wing. Otherwise, Stefano Sturaro would get the nod. It is always very interesting to see how Allegri deals with youngsters: in the pre-game presser he has strongly invited Pjaca basically to run and defend more because “football is not only technique, but also sacrifice and availability.” The coach is asking the winger to step up now that he is seeing the field and hopefully he can have an impact. Withouth Mandzukic, who defends like a fullback, there could be some balance issues, however it would be a pity if the coach did not give Pjaca a chance in an easy home game. While they would be all starting with a different scheme, only two between Sami Khedira, Claudio Marchisio and Miralem Pjanic would feature with 4-2-3-1. The Bosnian has been held out lately because of a sore foot, but nothing too serious since he still made some cameos. The most logical candidate for resting would be Khedira, but we will see as the coach praised him for being able to pace himself. Mario Lemina played few minutes against Cagliari, so there are plenty of options available to switch to a more numerous midfield. No Mandzukic means that Gonzalo Higuain and Paulo Dybala will have to wait to get their day off. Dybala will be facing his former team, which is usually always very motivating. The main point for Juventus will have to be focusing on the current opponent and not look ahead at the Porto clash. 4-2-3-1: Buffon; Alves, Bonucci, Rugani, Asamoah; Marchisio, Pjanic; Cuadrado, Dybala, Pjaca; Higuain. Chiellini (hamstring), Barzagli (hamstring), Mandragora (foot). 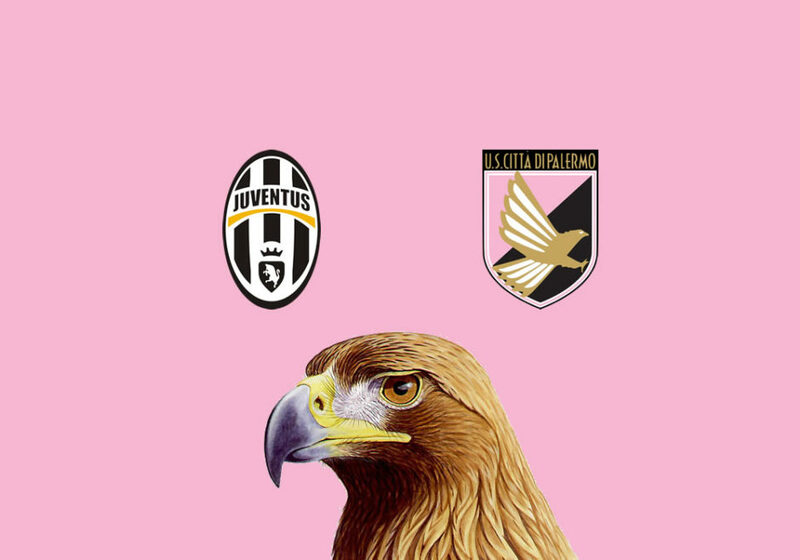 After getting real close last season, it looks like Palermo are destined to return to Serie B this year. The relegation race has been dismal so far as Rosanero, Crotone and Pescara have collected to little points, making everybody’s else life in the outskirts of the table so much easier. The volcanic president Maurizio Zampari has gone through so many coaches and executives that he finally broke the toy. They started the season with Davide Ballardini at the helm and Daniele Faggiano as sporting director. Then they made an ambitious hire, the rookie Roberto De Zerbi, a young coach who will probably have a very good career but was a little out of his depth due to a direct jump from Lega Pro to Serie A. Faggiano left, replaced first by Dario Simic and then by Nicola Salermo as the transfer market guy, and they tried to improve things on the bench with Eugenio Corini and then finally Diego Lopez. Not acquiring any decent reinforcement in January was an interesting move. The former Cagliari coach had a good start but decisively lost the last home game against Atalanta. They have two fundamentals problems: the squad is so little talented that no coach is going to fix that with tactical changes. They sold Franco Vazquez this summer and the wheels came off as they lost their main reference point. The only bright spot has been Ilija Nestorovski, who has scored nine goals so far, but he is a finisher and they miss somebody who can create for him and for others and carry the team. Just as Robin Quaison was starting to assume that role, they decided to cash in on him because he had an expiring contract. Secondly, they have an horrendous home record: four points in twelve games at Barbera. If you want to avoid relegation, you have to at least defend your own turf. They are OK on the road but that has not made up for the home struggles. Their defence is very leaky and at times gift opponents some easy goals. At the club they are trying to talk up the goalkeeper Josip Posavec and the centre-back Edoardo Goldaniga, maybe hoping someone would take the bait and pay a pretty penny to have them in the summer, but they alternate good performances with unwatchable blunders. They are dealing with few notable injuries: Giuseppe Pezzella picked up a significant hamstring strain and will miss a couple of months, while also Slobodan Rajkovic has been dealing with a calf ailment for quite a while. Also sidelined is the new striker Stefan Silva. Diego Lopez has been using 4-3-3 in the last three games, but he should opt for 3-4-3 in this one. Toni Sunjic or Thiago Cionek will supplant one of the usual starting midfielders, likely Ivaylo Chochev. Andrea Rispoli and Haitam Aleesami will be the wing backs, with Bruno Henrique and one between Andrea Gazzi and Mato Jajalo in the midfield. Upfront, the coach should give a chance to Norbert Balogh, who can play wide despite being a giant, replacing Carlos Embalo. The last spot will go to Aleksandar Traijkovski, even though it is possible that Diamanti manages to sneak into the XI because of his experience. They could also decide to bulk up the midfield and go with a two-man attack and at that point Chochev would be the frontrunner to start. To my account, they have tried at least three different systems and they will be going for the fourth. The roster is probably built best for 3-5-2, but that has not been successful. The continous changes has not allowed them to build a proper identity. The one constant, despite all the losing, is that they have generaly been able to find the bottom of the net on the road. 3-4-3: Posavec; Sunjic, Gonzalez, Goldaniga; Rispoli, Henrique, Gazzi, Aleesami; Balogh, Nestorovski, Trajkovski. Pezzella (hamstring), Rajkovic (calf), Silva (hamstring), Fulignati.